Partnerships are central to Habitat Focus Areas. By bringing together the diverse expertise of NOAA and our partners, Habitat Focus Areas (HFAs) are conducting new research, developing tools to inform management decisions, and working with local communities. Sea Grant—a Federal-University partnership between NOAA and 33 programs based at universities across the country—is a natural partner for many of the HFAs. With their focus on research, on-the-ground extension services, and education for coastal and Great Lakes communities, the network of Sea Grant professionals are collaborating with HFAs in diverse ways around the country. Here is a look at some of those collaborations. Alewives are small, silvery fish that migrate from the ocean into Maine’s lakes and ponds each spring. One of twelve sea-run, or diadromous, fish that make their way into the Penobscot River watershed, alewives are food for other fish, seabirds, and mammals, and support commercial fisheries in a number of coastal towns. Beginning in the 19th century, dams, culverts, and other barriers to fish passage have cut alewives off from much of their historic habitat. Today, thanks to the dedication of local volunteers, non-profits, and other partners, the Penobscot River HFA is helping to restore fish passage by building fishways and removing old dams. To tell the story of alewife restoration within the Penobscot watershed, Maine Sea Grant’s Catherine Schmitt has developed a series of outreach materials in collaboration with The Nature Conservancy, NOAA, and local community partners. 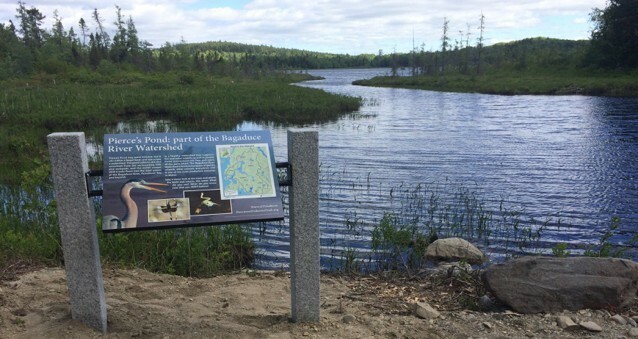 In the Town of Penobscot, the Maine Sea Grant Communications Team produced five interpretive panels for installation at Pierce’s and Wight’s ponds, where new nature-like fish passageways were created with NOAA HFA funds to allow alewives to migrate into lakes for spawning. Other materials have included an illustrated poster of the twelve sea-run fishes of Maine, an article about alewife returns to Maine lakes in the Maine Boats, Homes & Harbors, and a series of fact sheets called Connecting Rivers that explore how communities and land owners are helping to reconnect rivers and streams and restore fish passage. By communicating the benefits of habitat protection and restoration for fish populations, water quality, recreation opportunities, and coastal community resilience, Sea Grant is helping to build support for alewife restoration. Interpretive panel at Pierce’s Pond in the Bagaduce Watershed. A nature-like fishway was recently installed to restore alewife passage into the pond. Credit: Catherine Schmitt, Maine Sea Grant. In the Choptank River Habitat Focus Area, the success of large-scale oyster restoration depends on improving water quality. Runoff from land development, stormwater, and agriculture lead to low dissolved oxygen and poor water clarity, which are harmful to the river’s oysters, crabs and fish, and the habitats that support them. Oyster restoration also helps improve water quality. By pumping water through their gills to feed, oysters trap nutrients and sediments from runoff, cleaning the water for other aquatic life. As an Extension Specialist with Maryland Sea Grant, Eric Buehl works with local communities to share the latest research in water quality and climate, and to connect them with resources to implement projects that will improve water quality in the Chesapeake Bay. Maryland Sea Grant has been a key partner in Envision the Choptank—a collaborative effort in the Habitat Focus Area working toward common goals for the watershed. Envision has allowed Eric to build new partnerships with conservation organizations, county planners, and town engineers to advance watershed restoration projects that benefit ecosystems and communities. A new partnership between Maryland Sea Grant and the town of Easton enabled Envision to secure a grant to develop designs for two stream restoration projects. “The town has seen the benefit of extra arms that can help build capacity through the Envision process,” says Eric. He also works closely with Envision’s Landowner Assistance Coordinator to provide technical assistance to homeowners interested in installing a rain garden or rain barrel on their property to control stormwater runoff. “The connections Eric has been able to establish, his on-the-ground knowledge, his dedication to the projects, and his support and guidance in establishing the Envision the Choptank collaborative have all been fantastic,” says Lauren Taneyhill, Choptank HFA Coordinator at the NOAA Chesapeake Bay Office. Sea Grant Extension Watershed Specialist Eric Buehl (right) and Chesapeake Bay Foundation Restoration Scientist Rob Schnabel assist with a stream assessment in the Town of Easton as part of an Envision the Choptank grant application to design two stream restoration projects. Credit: Sarah Hilderbrand, MD DNR. In the early 2000s, fewer than 10 adult coho salmon were known to return to the Russian River watershed each year. With the establishment of a conservation hatchery program in 2001 combined with collaborative efforts to remove barriers to fish passage and restore freshwater habitat, there are now a few hundred adult coho salmon that return to the watershed every year. To monitor these returning coho salmon, California Sea Grant and the Sonoma County Water Agency have established a Passive Integrated Transponder (PIT) tag antenna array near the mouth of the Russian River with support from the Russian River HFA. Tagged fish are detected as they pass through the antenna array, allowing scientists to monitor the success of the hatchery program and identify bottlenecks to recovery. “The line of communication between NOAA and Sea Grant’s monitoring program has meant we can be a lot more effective in allocating resources toward habitat enhancement projects that are really going to make a difference,” says Mariska Obedzinski, an Extension Specialist with CA Sea Grant who leads the monitoring program. The program has helped NOAA and its partners identify areas to restore fish passage, develop habitat enhancement projects, and improve stream flow for migrating salmon. A pair of coho salmon migrate upriver. Collaborative efforts have restored adult returns of coho salmon in the Russian River from fewer than ten to a few hundred. Biscayne Bay Water Watch (BBWW), a citizen science water quality program developed by the UF/IFAS Sea Grant Extension Program in Miami-Dade County in 2015, enlists volunteers to conduct long-term monitoring of water quality in the Bay. One of the primary goals of the program is to raise awareness about the importance of the water quality challenges the Bay faces. “Biscayne Bay Water Watch started in order to get the community to understand that while the Bay might look beautiful and clean, there have been several algal bloom events in the last decade that suggest the Bay is becoming less resilient to withstand different stressors,” says Ana Zangroniz, UF/IFAS Sea Grant’s Extension Agent for Miami-Dade County. BBWW works with members of the boating community, who are trained in water quality sampling procedures by Sea Grant Extension agents. Those volunteers then “adopt” water monitoring sites throughout the Bay. Once the water samples are collected, NOAA’s Atlantic Oceanographic and Meteorological Laboratory (AOML) studies the water chemistry to identify nutrient and algal levels. The results of those analyses are available to the public on the UF/IFAS Sea Grant website. Monthly water samples taken by volunteers also help NOAA, Miami-Dade County, and local municipalities to better understand trends in water quality and the health of Biscayne Bay. Funding support from the Biscayne Bay Habitat Focus Area helps BBWW fill gaps in county and state water quality monitoring data. This information helps local managers to make decisions that will improve water quality for the benefit of the environment and local economy. 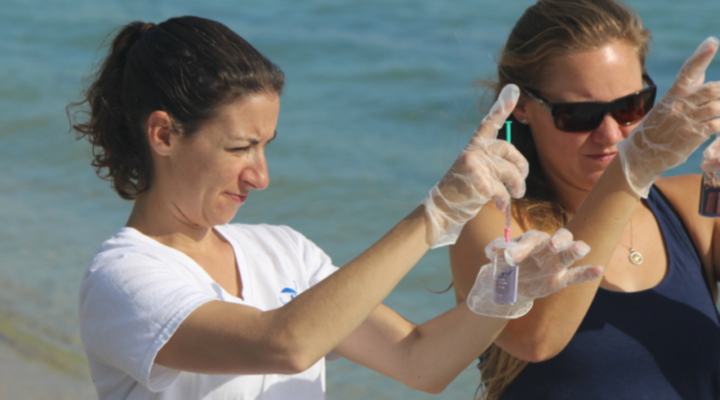 Biscayne Bay Water Watch volunteers take monthly water samples to help monitor water quality in Biscayne Bay. Credit: Miami Waterkeeper. West Hawai’i is a special place where unique ecosystems meet cultural practices and a thriving regional economy. Home to one of the longest contiguous coral reefs in the state, stewardship is integral to protecting one of Hawaii’s most biologically, culturally, and economically important areas. A diverse and dedicated group of organizations and communities are partnering in West Hawai’i from mauka (mountain) to makai (sea) to support healthy watersheds for natural resources and communities. 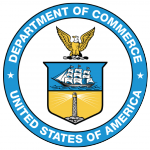 The Hawaiian Islands Sentinel Site Cooperative (HISSC) is coordinated by the University of Hawai’i Sea Grant College Program (Hawai’i Sea Grant) in close collaboration with NOAA. The HISSC has aligned priorities and resources with NOAA’s Habitat Blueprint program to work hand-in-hand on a cross-section of priorities in climate change and resilience in the West Hawai’i Habitat Focus Area. This alignment supports organizations like The Nature Conservancy, the Kohala Center, and the Kai Kuleana Network to implement collaborative projects in West Hawai’i. Projects include mapping erosion hotspots to reduce sediment impacts on coral reefs, modeling the projected impacts of sea-level rise on anchialine pools and heritage sites, and organizing citizen scientist volunteers to document the impacts of extreme tide events. Hawai’i Sea Grant is also a key partner in research and restoration projects within the HFA focused on tracking and reducing land-based sources of pollution and stormwater runoff to coral reefs and other nearshore ecosystems. Partnerships drive efforts to protect and restore West Hawai’i’s coral reefs and other nearshore ecosystems from erosion, nutrient pollution, and storm water runoff.